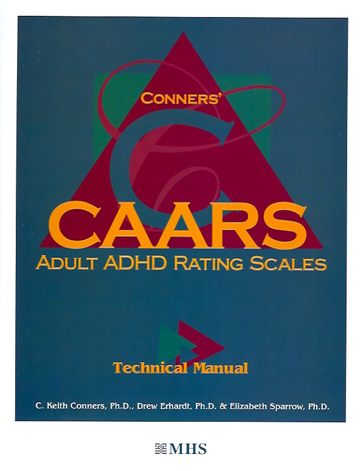 The Conners' Adult ADHD Rating Scales (CAARS) fulfill the need for a reliable and valid measure of ADHD symptoms for use with adults. The CAARS provide a multimodal assessment of symptoms and behaviors associated with ADHD in adults aged 18 and older. The CAARS are a set of easily administered instruments consisting of self-reports and observer ratings allowing for the multimodal assessment of adult symptoms and behaviors. Normative data for the self-report forms consist of 1,026 non-clinical adults (ages 18-80), while normative data for the observer forms are based on spouses, family members or friends of 943 non-clinical adults (ages 18-80). The CAARS employs the easy-to-use MHS QuikScore format for administering, scoring, and profiling, and separate norms are available by gender and age-group intervals. CAARS QuikScore forms are available in long, short, and screening versions. Scale descriptions and administration times for each version are described below. Scoring the CAARS will take about 10 minutes using the handscorable QuikScore form. Keith Conners has has an extraordinary career as an academic, clinician, researcher, lecturer, author, editor-in-chief, and administrator. His dedication to the study of ADHD and other childhood problems has propelled him to the forefront of his field. He has written several books on attention deficit disorders and neuropsychology an hundreds of journal articles and book chapters based on his research regarding the effects of food additives, nutrition, stimulant drugs, diagnosis, and dimensional syndromes. He is truly an asset to the field of psychology. Dr. Drew Erhardt is currently Associate Professor at Pepperdine University's Graduate School of Education and Psychology. Prior to obtaining this position, Dr. Erhardt was Assistant Clinical Professor in the Department of Psychiatry, Division of Medical Psychology at Duke University Medical Center. He earned his doctorate in clinical psychology from University of California, Los Angeles (UCLA) and completed a postdoctoral fellowship at the UCLA Neuropsychiatric Institute and Hospital. Dr. Erhardt is a licensed psychologist whose research and clinical work focus on the diagnosis and treatment of ADHD and other psychological disorders originating in childhood. He has written numerous empirical articles and book chapters pertaining to disruptive behavior disorders and, along with Dr. Keith Conners and Ms. Elizabeth Sparrow, has developed ADHD-related interviews. Elizabeth Sparrow received her doctorate in clinical psychology (with a specialization in neuropsychology) from Washington University in St. Louis. She has completed clinical training at St. Louis Children's Hospital and the University of Chicago, and is currently a Post-doctoral Fellow in Pediatric Neurpsychology at Johnd Hopkins School of Medicine and the Kennedy Krieger Institute. Dr. Sparrow's clinical experiences include neuropsychological assessment, therapy, individual academic remediation, and parent-teacher consultation. She has received academic grants and awards for her developing research interests in neuropsychology, ADHD, and executive functions, and her work has been published in book chapters, journal articles, and conference presentations.